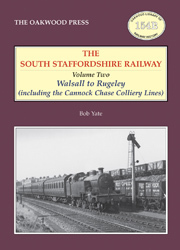 Volume One of this work dealt with the South Staffordshire Railway (SSR) ‘main line’ from Dudley through Walsall and Lichfield to Wichnor Junction, along with the branch lines to the south and east of Walsall. This second volume examines the story of the line from Walsall to Cannock and onwards to Rugeley, together with the complex of lines serving the collieries on Cannock Chase. The line from Walsall to Cannock was opened in 1858 and from Cannock to Rugeley the following year. The first of many lines serving the established coal mines on Cannock Chase followed quite quickly, and over the course of the following 30 years were added to as new mines opened. Several other companies, notably the Great Western, took an interest in the area and attempted to gain access to the rich coalfield. However, all attempts were driven off by the London & North Western Railway. The line from Walsall to Rugeley was of primary importance for the coal traffic, and its passenger services never really developed a satisfactory level of traffic. Nonetheless, the line became of strategic importance as a diversionary route for main line expresses, as a result of bottlenecks at peak times and interruptions on the Trent Valley and Stour Valley routes. Consequently, a considerable variety of locomotives were to be seen on the line over the years on both local and long distance passenger and goods workings. Because of this strategic importance as a diversionary route it was spared complete closure. All of the collieries in the area closed, but coal traffic continued to be of importance on the line, albeit serving the power station at Rugeley. With the introduction of ‘park and ride’ facilities at each of the stations, passengers returned. Coal is still conveyed to Rugeley power station slathough much of it is imported. The line also sees some long distance freight passing through. A5 format, 208 pages, 204 illustrations.